For the last four years, rational discussion of fiscal policy has been drowned out by wild comparisons with Greece and ritual invocations of trillion-dollar deficits. 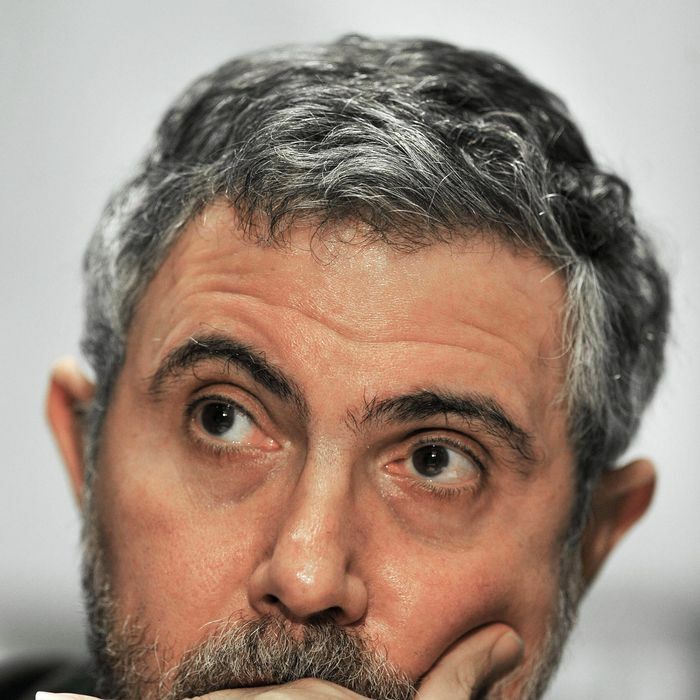 Paul Krugman and Joe Weisenthal yank the debate back into rational territory. Krugman’s and Weisenthal’s argument is that our scary-sounding trillion-dollar deficits mainly just reflect a bad economy. With massive unemployment, we don’t want to bring the short-term deficit down. They demonstrate this by calculating the effect of the depressed economy on lower tax revenue and higher spending on things like unemployment, but you can also just look at it historically. The projected deficit skyrocketed to over a trillion dollars before Barack Obama even took office, which is pretty obvious proof that our trillion-dollar deficits didn’t come about because of his massive socialist program. The trouble is that, having pulled the debate back into rational territory, they keep pulling. They’re right that you’re basically okay if your deficit doesn’t rise as a share of the economy. But if the deficit is growing at the same rate as the economy in good years, then it’s going to grow way faster in bad years. That’s the problem George W. Bush created. Bush inherited a budget that was probably balanced during normal years, was creating surpluses in really good years, and was producing medium-size deficits during recessions. He turned that into a budget that was still in deficit in its best years and running trillion-dollar deficits in bad years. That isn’t good. The funny thing is that Krugman and Weisenthal are actually vindicating the Bush record of budgetary management. (Krugman argues in a blog post, “The budget wasn’t deep in the red in 2007, and there have been no fundamental increases in government responsibilities or cuts in taxes since then.” True! But a budget that still runs deficits even at the peak of the business cycle means you’re going to be devoting a large and growing share of your budget to paying interest on the national debt. Now, maybe a deficit of the current size isn’t so awful that we have to agree to terrible policy in order to fix it. We don’t. We’re not Greece, we’re not becoming Greece, and the consequences of the deficits are not the threat to life on Earth that the deficit scolds have made it out to be. The Center on Budget and Policy Priorities has argued that the alleged need for $4 trillion in deficit reduction cited over and over by the fiscal scold community may be overstated, but $2 trillion in additional savings would nicely stabilize the debt.